The Burschenschaften or Studentenverbindungen (students' associations) have played an important role in German history — and the history of the German flag — around 200 years ago. Nowadays they are basically small, insignificant groups with (mostly) right-conservative, in some cases even right-radical, political opinion. There have been several scandals in Munich and the rest of Bavaria with NPD members being also member of one of the Burschenschaften. Although most of them are just conservative and not radical, the distinction is not always easy. Important university towns, such as Heidelberg, have a lot of Burschenschaften. For instance, the two flags on this picture taken at Heidelberg belong to Frankonia (yellow-red-black-yellow) and Rhenania (blue-white-red) Burschenschaften. Sources: Frankonia website and Rhenania website. There was an article not long ago by Jorge Hurtado in Gaceta de Banderas [gdb] with descriptions and images of very many Burschenschaften flags. An interesting subject. At the beginning of the 21st century it is considered an urban legend, that the national colours had been based upon the uniforms of the militia of Major Ludwig Adolf Wilhelm Freiherr von Lützow (1782 - 1834), a unit of volunteers. The members were mostly students of the Jena students' association "Vandalia". The very first predecessor of all athletics flags and of the current national colours seems to be the so called Kahla-Fahne (Kahla flag), the flag of a Jena students' association. The ratio was approx 6:5. It was a red over black horizontal bicolour with golden edging at either side. This flag had been flown only on two occasions: Probably on 18 Oct 1815, the day of the victory of the allied troops over Napoleon I at Waterloo, at Jena market square. Furthermore, and that's for sure, on 19 January 1816 on peace festival of Jena University, hoisted by the students themselves. The Kahla flag was replaced by this model on occasion of Wartburg festival, which took place on 18 October 1817, dedicated to the 300 years anniversary of the death of reformator Martin Luther (died 31 October 1517). The flag was denoted as a "gift to the organized students of Jena". It was this flag, which inspired the probably first flag of a German athletics club, the Hamburger Turnerschaft 1816. It remains a mystery, why the colours red and gold of the Jena students association Vandalia, turned out black and red on the sheet of the flag. There are conjectures, that their colours together with the black, red of the Lützow militia preceded the German national colours. It is also an urban legend that black, red and gold had been the colours of the former Holy Roman Empire. Those were indeed red and white. Since the 14th century they were overlayed by black and gold of Habsburg kin. But in the heads of German people of the early 19th century these colours were also shining as those of the Eagle of the Holy Roman Empire, which appeared after the doom of the empire as a faint reminder on a brightful gloaming past. In 1848 black, red and golden were adopted by the National Assembly, which held their meetings in Frankfurt's St.Paul's Church. Marcus Schmöger wrote 24 Jan 2002: For the Rhenania see here. For the Frankonia see the colours of their sash. Since I'm (randomly and slowly) cleaning up my huge collection of stuff to GIF and I believe that this should be at FOTW, I made the GIF of the flag that Marcus identified as the flag of the "Frankonia" Burschenschaft. The Ruderverbindung(fraternity) is affiliated with the Akademischer Ruderverein "Westfalen" in Münster(rowing club). The are different entities due to terms of laws. It is a light blue (FIAV-code B--) over white over blue (FIAV-code B) horizontal tricolour. This flag is called "Kneipfahne", which can't be really translated. It is the fraternity flag with the Zirkel in its centre in an "indicated" shield. This flag was destroyed in WWII. The new ceremonial flag also has a Zirkel in its centre surrounded by the fraternity's motto: "dem Vaterland ergeben den Kräften vertrauend" (devoted to our country trusting in our own forces). Alte Turnerschaft Slesvigia Niedersachsen Hamburg-Königsberg im CC zu Hamburg shares its home with Corps Rhenania Hamburg at Johnsallee Hamburg . The ratio is perhaps 1:2. It is a horizontal 5 stripes flag ordered white-black-white-green-white. The ratio of stripes is 1:2:2:2:1. You may as well say, that it is a horizontal tricolour with white edge at top and bottom. The flag is a green over white over yellow horizontal tricolour. It is remarkable that the colours of the coat of arms are green, white and black instead of yellow. Source: I spotted both, flag and coat of arms in front of the fraternity house in Bielefeld-Dornberg on 2 October 2011. Corps Rhenania Hamburg is member of the association WSC. The fraternities building is in Johnsallee Hamburg near Hamburg University main building. There exists at least another Rhenania fraternity in Heidelberg, mentioned on FOTW. The colours are the same but the order of colours is different. So I don't know, whether they belong to the same organization. A member of ARV "Westfalen" told me, "fraternity" would be a good translation of "Studentenverbindung". The ratio is probably 3:5. It is a white over black over light red(R-) horizontal tricolour. 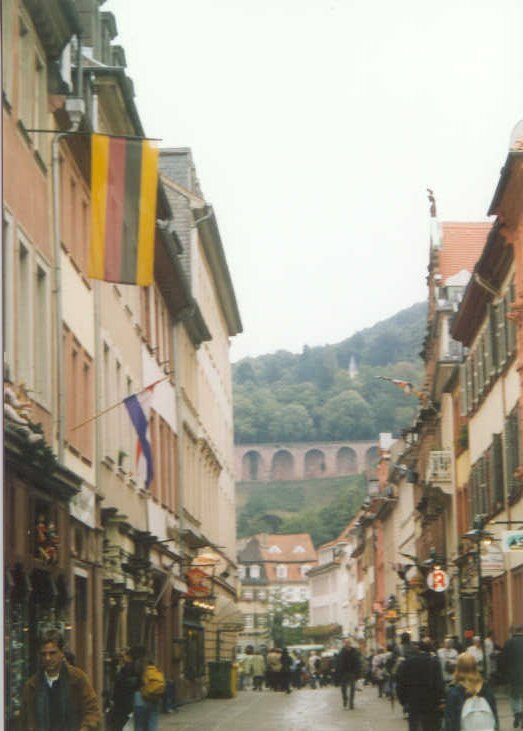 I have been in Heidelberg Germany for over 15 years and just last week I saw a flag like the one attached. I thought it was the old Northern German Empire Flag, but then it's just the same as the Kamchatka Territory (Russia) upside-down. It was displayed on a flagpole projecting from the building (ratio 3:2) and also banner style from a freestanding pole (ratio 5:2). The building had the sign: Thüringen Corps. I still am trying to find out what that is or who they are. It doesn't seem to be a new organization. What do you know? There is most probably a totally different solution, and the four-coloured flag (yellow-red-black-yellow) was the one that pointed to that for me. These are flags of Burschenschaften-Studentenverbindungen (students' associations). As Heidelberg is an important university town, there are also a lot of these Burschenschaften around. Each of these have their colour combinations (two, three or four colours), including rare colours such as pink in many cases. These colour combinations are displayed as sashes mainly, but also as striped flags on the buildings belonging to the Burschenschaft. The Burschenschaften had been playing an important role in German history (and the German flag's history) around 200 years ago. The Studentenverbindung in this case is the "Corps Thuringia" (names are traditionally latinized, i.e. not "Thüringen" but "Thuringia"). On Das Corps Thuringia website you see their coat-of-arms, that displays the colours black-red-white (bendwise) in one quarter, as well as in a pennant.